We’re only a week into last week’s Darts bets and if you were following, you’d have scooped the King/Caven double and also came good in the Evens, 6/4 and 6/4 winners from our 5 outsiders tips. With Taylor losing, the draw is wide open and if we backed Lewis @ 13/2 and King @ 150/1, they are now in to 5/2 and 80/1 respectively so hopefully we’ll get a nice run out of one of them, as unfortunately they collude in the 3rd round should they both get that far. Let’s hope if it’s Lewis, that he’s still piling up the 180s to keep that bet alive. There’s not too many big events on over the Christmas so let’s take a look at some of this weekend’s fixtures in the English Premier League. Last week, Arsenal were installed as favourites for the first time this season, but that didn’t last long as a resounding 6-3 defeat to Manchester City brought them right back down to earth with a bang. It doesn’t get any easier for the league leaders on Monday as they host Chelsea where a defeat could leave Arsenal sitting in 4th place if results go against them, after a season that had promised so much. Let’s start with Liverpool at home to Cardiff, with Liverpool having the chance to go top of the league if they win their early afternoon battle against a Cardiff team in disarray after their manager was told that he must resign or be sacked by their outspoken owner. Liverpool are full of confidence going into this game and they would love the chance to sit at the top of the pile, if only for a few short hours. The ink still has yet to dry on Luis Suarez’s new contract, reportedly worth in the region of £200k a week for their prolific marksman who has netted 17 goals in just 11 appearances for The Reds. That’s more goals than half the teams in The Premiership have managed! 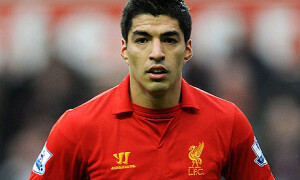 Expect him to come out firing and my first bet of the weekend is Suarez to score 2 or more goals @ 7/4 with William Hill. Should Liverpool go top, then Man City will want to hang on to their coat tails by picking up all 3 points in the 3pm kick-off away to Fulham. With a goal difference of +29 and facing a team lying 2nd bottom with a -15 goal difference, I can only see this match going one way, and that’s a big win for City. With Aguero out for up to 8 weeks, most of the limelight to fall on Alvaro Negredo and I expect him to find the net in a Man City win @ Evs with Boylesports. I’m also liking Man City to win both halves @ 2/1 with PaddyPower. Both Manchester United and West Ham won League Cup quarter finals during the week, and they go head to head on Saturday. United are on the back of 3 straight wins without conceding a goal and they are facing a West Ham team who have scored only 13 league goals this seasons, which is the 3rd lowest in the league. In the last 4 meetings between the sides at Old Trafford, Man Utd have won all 4, scoring 8 goals and conceding 0, so we’re going for the option again and backing Manchester United to win to nil @ 5/4 with Coral. We’ll finish off with the top of the table clash between league leaders Arsenal and 3rd placed Chelsea. The omens aren’t good for the Gunners as this will be the 11th meeting between an Arsenal managed Arsene Wenger and a Chelsea managed Jose Mourinho. In the previous 10 meetings, Arsenal have failed to pick up a single win and I don’t see that changing on Monday night. Chelsea have won on their last 2 visits to the Emirates and I’m going to go for a Hat-trick when they meet again, and will be taking the 23/10 with Bet365 as it represents massive value for me.